Includes: Instrument, 2'x2' (610x610-mm) hood with frame and support poles, swirl-x flow conditioner, wheeled carrying case, 18-inch (46-cm) pitot probe, 2 static pressure probes, 16' (5.0m) Neoprene tubing LogDat CH downloading software with cable, neck strap, (4) AA rechargeable NiMH batteries, 2 battery holders, internal battery charger, NIST traceable calibration certificate, user manual and multi-country AC power adaptor with US, UK/Hong Kong, Europe and Australia plugs. 8380 2' X 2' Capture Hood Kit. 8380 – STA : 8380 with CH-Stand and tablet. 2' X 2' (610mm X 610mm) Balometer capture hood-frame-base 30 - 1000CFM (ft3/min) analog meter, wheeled luggage-style carryingcase,(4) AA alkaline batteries, NIST calibration certificate and manual. 16" X 16" (406mm X 406mm) Balometer capture hood-frame-base 30 - 1000CFM (ft3/min) analog meter, wheeled luggage-style carrying case, (4) AA alkaline batteries, NIST calibration certificate and manual. NOTE: If ordering additional hood and frame kits, then support pole kit 1083682 must also be ordered to accomodate the larger sizes. 2' X 2' (610mm X 610mm) Balometer capture hood-frame-base 50 - 2000CMH (m3/h) analog meter, wheeled luggage-style carrying case, (4) AA alkaline batteries, NIST calibration certificate and manual. 16" X 16" (406mm X 406mm) Balometer capture hood-frame-base 50 - 2000CMH (m3/h) analog meter, wheeled luggage-style carrying case, (4) AA alkaline batteries, NIST calibration certificate and manual. NOTE: If ordering additional hood and frame kits, then support pole kit 1083682 must also be ordered to accomodate the larger sizes. 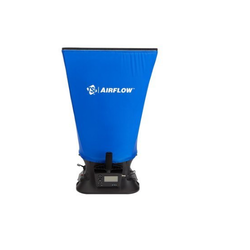 Looking for Air Flow Capture Hoods ?